Catalogs are being damaged so frequently in the mail that one company has turned the problem into a new business venture. “A recent project involving a national catalog brand showed that 23 percent of the catalogs received by our field agents arrived in poor condition,” a US Monitor press release said recently. The U.S. 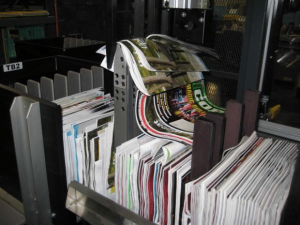 Postal Service’s Flat Sequencing System earned the nickname “Flats Shredding System” from postal workers because of its propensity to mangle magazines, catalogs, and other flat mail. In its early days, FSS generated plenty of complaints from mailers about damaged pieces. The huge machines have been tweaked to reduce torn covers, “flyouts”, and other such problems. Still, shifting catalogs from traditional carrier-route bundles to FSS seems likely to cause more damage, especially for thin, flimsy copies. More via Dead Tree Edition: U.S. Postal Shredder (USPS): Damaged Catalogs Spark New Business Idea. This entry was posted in Downsizing USPS, General Union Business and tagged catalogs, complaints from mailers, damaged mail, Dead Tree Edition, flat mail, Flat Sequencing System, Flats Shredding System, flyouts, FSS, magazines, torn covers, U.S. Postal Shredder, US Monitor. Bookmark the permalink.